FREEPORT, Grand Bahama Island, March 25, 2014 /PRNewswire/ — Concierge Auctions, a New York-based luxury real estate auction firm that sells high-end properties worldwide, and local partner, Sterling Bahamas Realty, today announced the April 30th auction of The Boat House and Ship Owner townhome, two estates that rest within the walls of the exclusive, five-star Grand Bahama Yacht Club in Freeport, Grand Bahama Island. The Boat House, originally offered for $5.5M, features five bedrooms and five and a half bathrooms spread across three expansive residences, including a main boat house, guest cottage, and studio. The house’s most distinctive feature – and the source of its namesake – is an enchanting boat slip and lift area that serves as the highlight of the ground floor. Lit by the glow of antique chandeliers and engulfed in rich mahogany finishes and Ipe wood flooring, the boat slip allows the owner of the home to enter without ever having to touch land. The grandeur of the slip area is topped off by the 36-foot, jet-powered Hinckley Picnic Boat that is docked within it; handcrafted and derived from one of the world’s most renowned lines, the luxury craft is included with the sale. Sitting on one acre of lush waterfront property, the main house boasts nearly 8,000 square feet of living space and soaring, 14-foot ceilings. The home’s natural blend of traditional Danish and Caribbean architecture is striking, from the upper floor of the main boat house – which is defined by an open living, kitchen, and dining concept – to the master suite, study and powder room. Wrap-around balconies surround the upper floor on three sides, offering brilliant views of the marina, while windows and doors crafted of solid Honduras mahogany complement the island setting. As if the boat house itself isn’t enough, there is a 600-square-foot studio and an additional 1,220-square-foot guest cottage for friends. In the cottage, nearly every room — living, kitchen and bedroom — opens onto the balcony, affording fantastic views of the water. 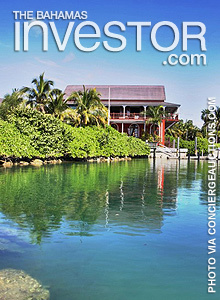 “Just a 45-minute flight from Miami and with direct flights from Atlanta, New York, Canada and London, these properties offer seclusion, a tropical environment, and all the most modern amenities without the hassle of going to a remote, inaccessible resort,” said Lamond Davis, who is representing Sterling Bahamas Realty as the Listing Agent of the estates. Located along the marina, the Ship Owner townhome mimics the same traditional Danish style found in the Boat House, including the vista of sailboats as they make their way to harbor. Originally offered for $1.199M, this four-bedroom, three and a half bathroom unit is spread over 3,000 square feet of indoor living space. Ironwood flooring, Venezuelan mahogany French doors, and floor-length shutters on every door and window enrich the space. While residents can enjoy the privacy that The Boat House and Ship Owner townhome offer, they also have the choice to socialize with neighbors, as the sale includes membership to The Lucayan or Bahama Reef Golf and Country Clubs. With golf, tennis, swimming, fishing and yachting all within walking distance, activities abound to satisfy every taste and are inviting for family and friends to join in on the Grand Bahamian lifestyle. 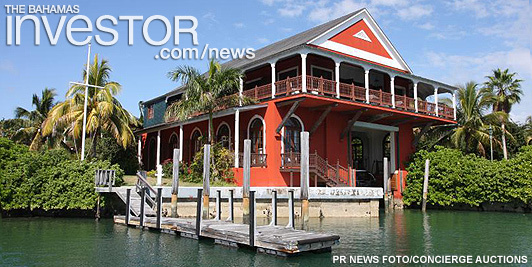 The auctions of The Boat House and Ship Owner townhome in Grand Bahama, Bahamas, will be held live on April 30th. A 3% commission is offered to the buyers’ representing brokers. The properties will be open for preview daily by appointment. See Auction Terms and Conditions for full details. For more information, visit GrandBahamaAuction.com, call (877) 949-6639 or join the social discussion at #ConciergeAuctions. Concierge Auctions is a New York City-based luxury real estate auction firm founded in 2008. Concierge Auctions serves high-net-worth individuals internationally through an accelerated marketing process that obtains fair market value for high-end properties. The firm executes auctions typically valued between $2.5 million and $20 million. This property is listed for sale by Sterling Bahamas Realty Limited (Broker Paul K. Lowe, Lic #380) – Sterling Companies, New Providence Financial Center, East Bay Street, PO Box N1812, Nassau, Bahamas (242) 677-1900. Concierge Auctions, LLC is the provider of auction marketing services – 777 S Flagler Drive, West Palm Beach, FL 33401 (888) 966-4759. The services referred to herein are not available to residents of any state where prohibited by applicable state law. Concierge Auctions LLC, its agents and affiliates, broker partners, Auctioneer, and the Sellers do not warrant or guaranty the accuracy or completeness of any information and shall have no liability for errors or omissions or inaccuracies under any circumstances in this or any other property listings or advertising, promotional or publicity statements and materials. This is not meant as a solicitation for listings. Brokers are fully protected and encouraged to participate. High bid subject to lender confirmation. See Auction Terms and Conditions for more details.